Over 100 years after a Dundee-based aviation pioneer flew his experimental glider for the first time, his great-great-granddaughter has enjoyed her first flying lesson! When he was just 17, one year older than Isabella Coombs, David Urquhart was working as an amateur engineer with aviation trailblazer Preston Watson. Preston had the vision, talent and financial backing to develop his own aeroplane designs in what was the very earliest stage of experimental controlled powered flight. Harry Miles, Instructor, with Isabella. Preston’s earliest aeroplane was gifted to The Dundee Aero Club, founded by David Urquhart in 1909. Although the club was primarily concerned with the development of model aircraft, it also converted Preston Watson’s first aeroplane into a glider which flew very successfully. Its first flight, piloted by David Urquhart, was probably in 1909 – 109 years before his great-great-grand-daughter’s first flight, within a few miles of each other, but separated by four lifetimes. 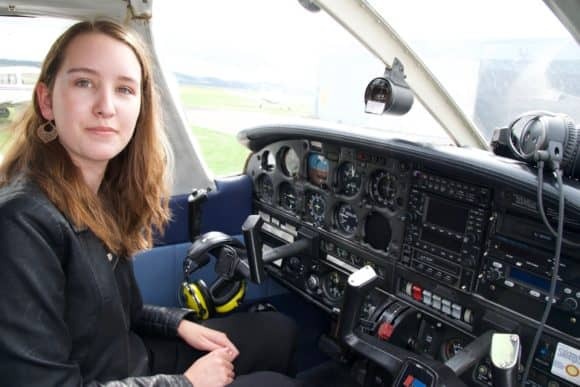 Courtesy of Dundee flying school Tayside Aviation, Isabella recently enjoyed her very first flying lesson after spending some time with her grandparents Bill and Wendy Urquhart in their Perthshire home. 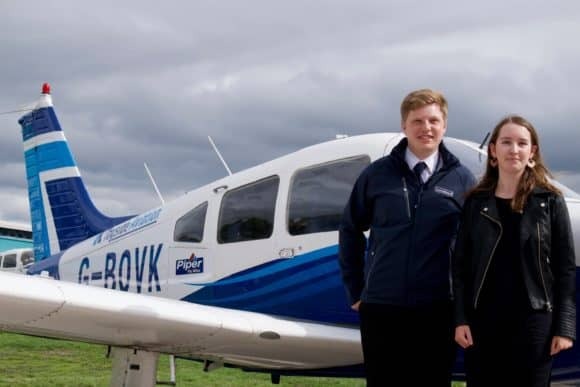 With the flying lesson voucher given as a 16th birthday present, Isabella had been keen to experience flying for some time and was surprised and delighted to discover the family connection with aviation in the Dundee area. As an accomplished design draughtsman and model maker, David applied himself to practical solutions while assisting Preston, including the use of a blacksmith’s anvil hoisted into a tree. By attaching the anvil to a rope, running the rope through pulleys and attaching it to the aeroplane or glider, it provided pulling power when the anvil dropped to assist during take-off. 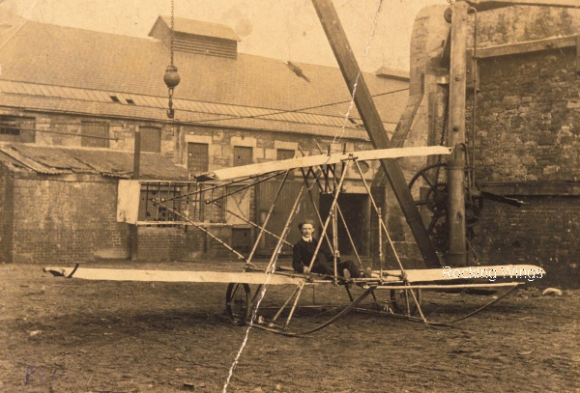 Credit: The Trustees of the National Museums of Scotland – David Urquhart seated in Preston Watson’s first aeroplane, after removing its engine and modifying it into a successful glider. Preston Watson’s achievements (and the part played by David Urquhart) are the subject of the book “The Pioneer Flying Achievements of Preston Watson” by Alistair W. Blair and Alistair Smith. Bill Urquhart met Alistair Smith quite by accident, without which chance meeting his family connection would have passed into obscurity. Isabella also found that other members of her family have aviation connections in the area. Her grandfather, Bill Urquhart, flew Chipmunks at Scone Aerodrome in the 1960s. Unknown to him, when he did practice landing approaches over the disused Errol airfield, he was flying directly above one of the sites used by David Urquhart and Preston Watson. Her other grandfather, Marcus Coombs, learnt to fly in a Chipmunk and also flew helicopters while serving with The Royal Scots Dragoon Guards. Her great-grandfather, David L Urquhart (son of David Urquhart) was, for many years Chairman of No. 2231 (Forfar) Squadron Committee and Dundee and Central Scotland Wing Representative Chairman, Air Training Corps for which he received an OBE in 1966. In 1967 he became a Life Peer, taking the title of Lord Tayside of Queen’s Well. Her grandmother’s uncle, Bill Callander of Forfar, had a very distinguished flying career with the RAF during World War II. He trained pilots in Canada, was promoted to supervise training, and then subsequently returned to the UK to fly pathfinder Mosquitoes which guided the main bomber forces to their targets in Germany. Isabella, who was born in London, is currently awaiting her GCSE results and hopes to study aerospace engineering at university after her A levels. She has very many interests including musical composition, novel writing, cryptography, art and science. For more information, and to book a flying lesson, visit www.taysideaviation.com or telephone (01382) 644372.